BANGI, March 4 2014 – The public, especially youths, should cultivate a culture of reason and logic and think with an open mind so that they can consider ideas and suggestions mooted by various parties. Youth and Sports Minister Khairy Jamaluddin said young people should avoid blindly supporting personalities without giving serious thought to what they should believe and uphold. He was giving his views as a panel member of a discussion at the Youth Leadership Conference in The National University of Malaysia (UKM) here today. The discussions on Idealism, Direction and Youth Challenges was organised by UKM and the Cheras Education Foundation (Yayasan Pendidikan Cheras). Khairy said youths should reject the culture of slander and defamation of public figures without first examining the authenticity of allegations made. “We should not oversimplify since allegations put up over the internet is too critical. We do not censor the internet and thus freedom must come with the culture of debate. That is the sign of an advanced civilization and cultural knowledge,” he said. 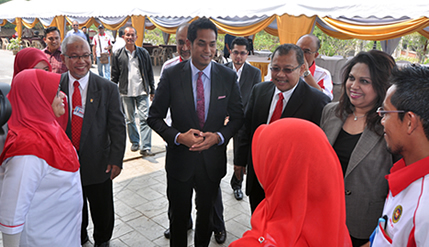 Khairy urged youths not to be unduely prejudicial to the point of being influenced by negative notions. There should also be a sense of nationalism among them. He also expressed sympathy with graduates who complained about the difficulties of finding jobs after graduating from the universities. “We cannot talk about realising the full potential before addressing the root problems. We needed to create jobs, tackle the rising cost of living and create a conducive environment for the youths,” he said. He, however, reminded youths not to be too dependent on the government with its limited resources . Also participating in the discussion was the first winner of a TV reality religious show Pencetus Ummah Muhammad Hafiz Mohd Haneefa and UKM Political Science lecturer Associate Professor Dr Mohammad Agus Yusof. Students from several local public universities and secondary schools attended the conference and discussions.